When throwing a party of any kind, providing adequate food for your guests is a major concern. If you offer too much food, you may end up munching on leftovers all week, while providing too little can put a damper on the whole event and leave guests feeling dissatisfied. There are many important points to take into consideration when portioning out your party trays. With some quick calculations, however, you can ensure that you have just the right amount of food on hand for the duration of your special occasion. Count the items on the party tray. You must know how many crackers and slices of cheese you have before you can figure out how many people a cheese platter will serve. Make at least a rough estimate of the number of carrot sticks, tomatoes and other pieces on a veggie tray. Estimate the size of each individual serving for your guests. If you are looking at a tray of cheese and crackers, a cube of cheese and a cracker makes one small serving. On a vegetable tray, two or three vegetables should be counted into each serving. Consider the type of guest that you will be entertaining when you determine an appropriate serving size. Teenagers will command a much larger serving size than seniors. Divide the number of pieces on the tray by the quantity included in each serving. 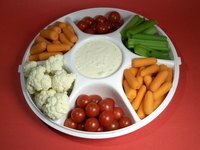 If your party tray has 15 small carrot sticks and you estimate three carrot sticks to each serving, you have five servings of carrot sticks. Note the total number of servings provided by your party tray and compare this with the total number of servings you need to provide your guests. On average, guests will consume five to eight servings per person in a predinner hors d'oeuvres hour. For a party where you are only serving hors d'oeuvres, plan for eight to 12 servings per person in the first hour, and four to six pieces per person every hour after that. Consider the popularity of each dish when deciding how much to provide. A shrimp tray will typically be much more popular than a veggie tray. How to Tell If a HVAC Damper Is Bad?